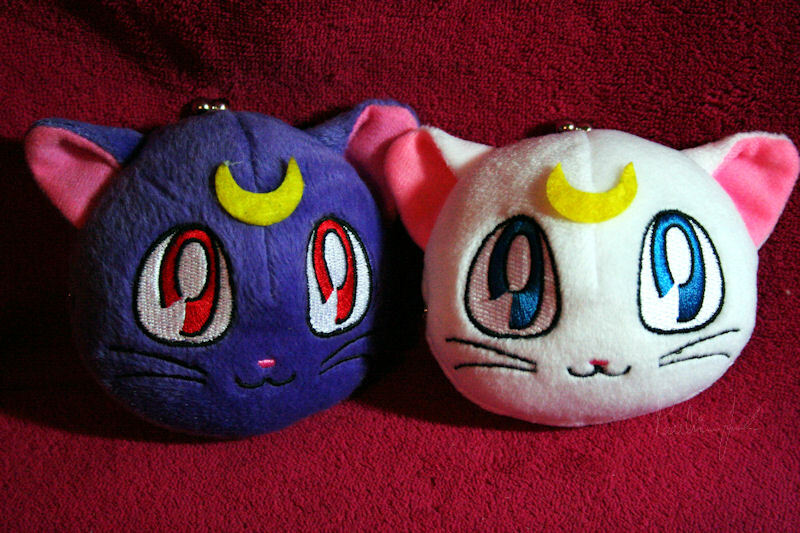 Cat Head Coin Purses – MoonFigures Collection, Art, and Reviews! These adorable coin purses are perfect for anyone who doesn’t mind bootlegged items. The fact that they made Artemis is enough to make any fan girl squeal. Although, once again, we’re faced with a light purple cat item. Despite the fact that I am dead set on calling these light purple cat items Diana, rather than Luna, I am forced to give up and call this one Luna. I’m giving in on this debate simply because the partner item is definitely Artemis. Be warned if you are purchasing this item for regular use; there is NOT a lot of room in these coin purses for actual coins. The inside is rather stuffed for the actual face. While I’m sure that some use would pack some of the stuffing down, I don’t think it would be enough to matter.